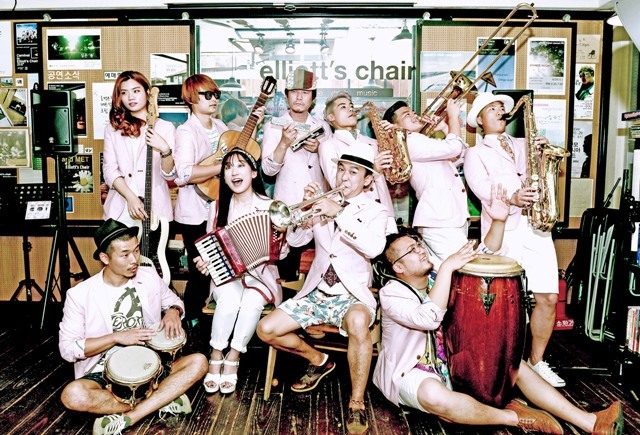 Jeju 10-piece band South Carnival mix ska, latino and reggae into their music. The Stepping Stone regulars speaks to The Jeju Weekly about the band and its ‘Island’ sound. How and when you did you form and why did you want to start this band? South Carnival was created after the guitarist from hard-core band 10 Minutes Later, Kyunghwan Kang, and his team were disbanded. He decided to cast colleague musicians to make a band with the purpose of playing music with authenticity, not for looking cool, and developing into mixing music from island countries from Central and South America such as reggae, ska and latin that fits into Jeju. You have a lot of members in your band. What are the advantages of having so many band members? First of all, I don't like singers who sing live very differently from their recorded sources. Since I have a strong faith in singing the same as we do on our records when we are on live stage to the audience, we have to have many members. That is one of our advantages. One of our drawbacks, however, is due to the number of members, the budget for traffic, food and management is double compared to other teams. Also, we have many conflicts too but it doesn't matter because having many members is a stronger advantage. Please can you describe your live shows? As we have worked on ensemble for a long time, we can play it really well which is one of our strong aspects. The audience can feel a great energy from our live performances on stage. How many times will you have played Stepping Stones after this weekend and what do you like about this festival? South Carnival has played five years in a row. 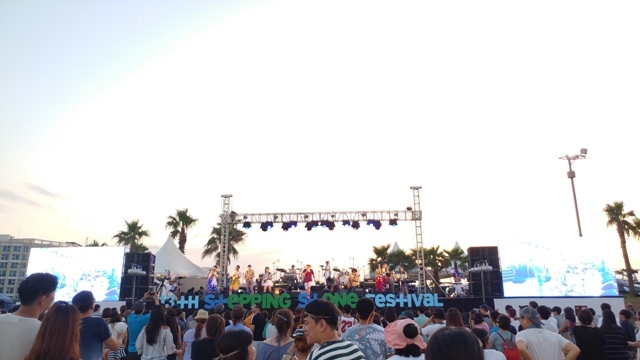 In 2015, we performed on the main stage at Incheon Pentaport Rock Festival, but personally I like Stepping Stone Festival much more. From a musician's stance, Stepping Stone Festival treats you so good that I felt the festival was for us from the very beginning. It has a 13-year history with a great line-up and is still getting better. Lastly, from the Province's stance, profits made from the operating booths are donated for gotjawal [Jeju’s unique forests]. I personally feel that the Stepping Stone is the future for festivals because large-scale national festivals have become saturated. Please tell me about your 2nd EP? When was it released? How do you feel about these new songs, and how have they been received by listeners? Our CD was released at the end of May. We are selling CDs offline in Jeju first and it will be released nationally at the end of July. This album consists of four songs with four genres. We decided to give it a new try this time. We have a jazzy, swing song that the audience hasn’t heard from us before, an authentic ska song fit for South Carnival - aiming for Neo-Ska. Then there’s Blue Night in Jeju, a popular Korean song with a cha-cha rhythm. It also contains the song that can succeed the popularity of Monttak Doreura. In that sense, this EP is us trying different approaches. We’ve had some satisfying responses from listeners. They’ve said the songs are much more appealing to the public. I’ve read that the name South Carnival refers to Jeju island and the ska style you play - is this correct? You write lyrics and sing in the Jeju dialect - why is this important to the band? We don’t write total Jeju dialects for the whole songs. Since our songs are based on the island, it could be Jeju dialect but we try to incorporate feelings that come from the island’s beaches, oreums and wind too. We can move listeners feelings only if we have authenticity in our songs. You must be the only band to play a ska/reggae style and sing in Jeju language - what reaction have you had from fans and the music industry to your unique style? What is most important to the band, more than talent, is that it’s unique. Music schools are well-established nowadays, but people don't say the band with the most technical skills are the best. It just means, there are many people who can play musical instruments very well. Bands need to give listeners reasons to listen to their music and not other bands. That's why bands should be unique. There's a difference between a band from Seoul playing latin music and South Carnival playing latin music in Jeju. Listeners must have bias when South Carnival play latin music simply because we are from the island. How do you feel about the music scene in Jeju? Although the number of the bands is increasing Jeju has a lack of diversity compared to other regions. I suppose it is because there’s been no band to go into the national market. There’s 99 Anger and Kang A Sol but they are not based in Jeju. When there are more bands based in Jeju, I believe musicians will be more motivated and find out how crack the bigger market. At the same time, however, I strongly believe that the market in Jeju will not lag behind any more very soon. Is there anything else you’d like to say to Jeju local people? It’s obvious that the reason why the music market in Jeju fails is in that people want to listen to mainstream music only. Apart from South Carnival, there are other bands like Zen Alone, Dear Island, Myohan, Namgida Band and Diodio. Only if many people get interested in other musicians' music, can more bands survive. We promise to be the band that can move Jeju people's mind. We ask for your continuous interest.